Tank was a year old on Halloween. He is a Shepherd/Lab mix. 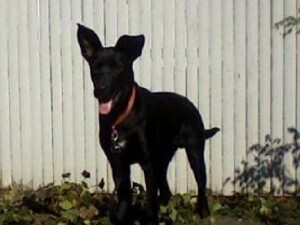 I got Tank on December 26 2008, from the SPCA. Tank likes to push all of the couch cushions off the couch and lay on top of the bare couch on his back with all fours up and howl. He also likes to dig holes, and is the biggest goof.